Slovene diver Vedran Dorusic and Croatian Igor Savic, the pair who found an untouched wreck site. 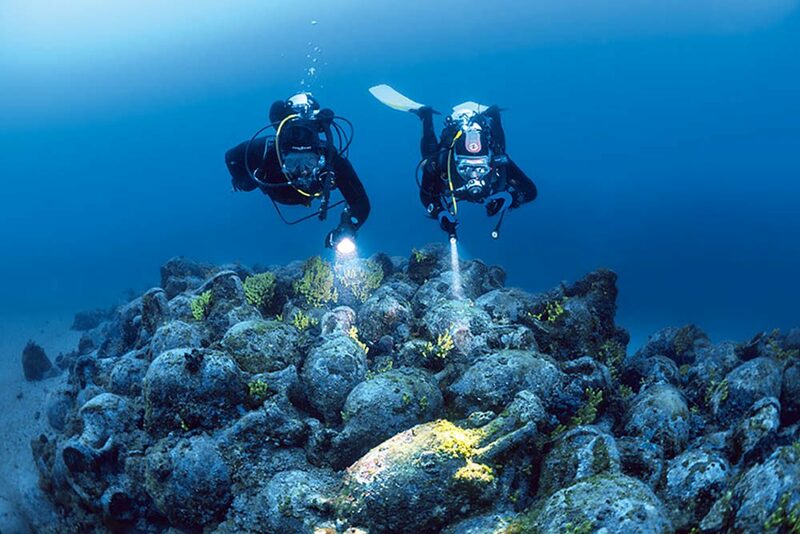 It is estimated that 600-800 amphoras are lying on the seabed, nearly all of them undamaged. THE MORNING JULY SUN was hidden in the clouds, and the first gusts of the bora were stirring up the sea. We were discussing possible locations for our morning dive. As it was windy, I thought it might be better to choose somewhere close. It was shaping up to be just another ordinary dive: one that rewards us with all the pure joy of diving, and then quickly fades from memory. How wrong I was! 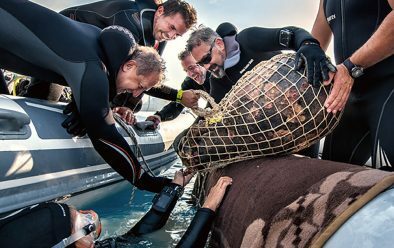 The Foka Diving Centre at the Simuni campsite on the southern coast of Pag (the fifth-largest island in the Adriatic Sea) is an excellent starting point for a variety of diving adventures. It lies a 10-minute speedboat ride away from spectacular walls and gorgonians near the small island of Maun. Ten minutes further on is the Planicic reef, known for vibrant sea life, but head instead towards the coast of the island of Vir and you can dive the wrecks of two WW2 German military speedboats. A slightly longer journey on a high-speed RIB takes you to the island of Premuda and a spectacular underwater cave, dubbed the Cathedral by divers for its size and beauty. I enjoy the many diving possibilities off Pag. On that Thursday, 27 July, Foka centre director Vedran Dorusic asked me where I’d like to dive. He nonchalantly followed up by asking if I’d already visited the spot where, a few weeks before, an old, most likely Roman, anchor had been found. It seemed an interesting tip, even though I’d visited the location near Simuni Bay many times, and wasn’t especially drawn to the place. Thank goodness I hadn’t suggested going to a more “intriguing” destination. In any case, I hoped that some fish would be waiting for us near the shallow wall in the bay, where they hide from fishing-nets and boats leaving the harbour, and that the promised anchor would make our dive worthwhile. FOUR OF US were planning to dive. We split into two pairs, and at the start one of the other pair had a buoyancy problem. As we began to descend along the wall, I noted how few fish there seemed to be. Those first few minutes of the dive were nothing out of the ordinary. At the bottom of the wall, at around 25m, the seabed flattened out into sand. I soon spotted the anchor. Partly covered and camouflaged by vegetation, it stood alone half-buried in sand. I wondered how it had ended up in this place. 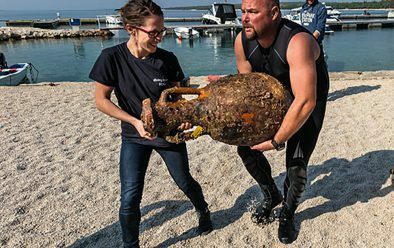 Vedran and Igor start to lift the first of the amphoras found at Pag Island, under the supervision of a team of Croatian underwater archaeologists. Nearby, a beautiful cove offers exceptional protection from the wind, and surely even Roman sailors would have been familiar with it. What a story that anchor would be able to tell, but it’s one that will always remain untold, I thought to myself. Yet again, I couldn’t have been more wrong. Vedran and I decided to continue a bit deeper, further away from the anchor and the wall. The other two divers stayed back and began slowly to ascend. A few minutes later, I noticed in the distance a strange dark shadow, probably a mass of rocks rising from the sand. It had clearly caught Vedran’s attention too, and we gradually got closer and closer, Vedran ahead of me. Suddenly I noticed him making some rather unusual movements. It would be hard to say if I had really seen a change, or if it was just a feeling. What would normally be regular calm motions had become quicker and livelier. Vedran was still swimming toward the dark rocks, with me in tow wondering what was going on. Something must have caught his eye. Some huge fish? As his movements became ever-jerkier, Vedran turned to me and made a gesture that clearly asked whether I’d seen what he had seen. He pointed to the dark mass. Only then did I realise that what I had taken to be rocks were an unusual, almost perfectly rounded shape. It hit me that what I was looking at probably wasn’t what it had seemed to be. Our excitement grew as we swam closer. The scene that opened up before us was unbelievable. Amphoras, a huge pile of them, all neatly arranged. Swimming over them, we couldn’t have been more thrilled. My heart was racing and my breathing speeding up. If I hadn’t known Vedran, I would have been nervous about the way he was moving around. The elation was bursting out of him; he had gone from merely floating to performing a dance of delight. He seemed to be wondering whether he was having hallucinations and if his air-fill could be at fault. 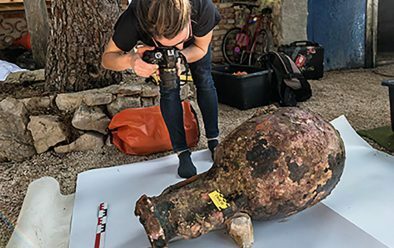 A quick check was enough to determine that the amphoras were undamaged. 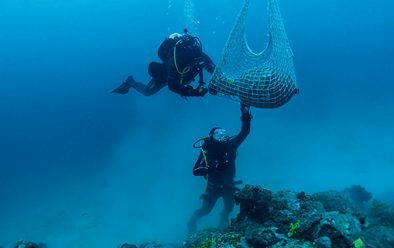 They had been waiting here undisturbed for centuries, perhaps even millennia, and they had avoided all the dangers inherent in the sea, especially today’s methods of intensive fishing. The first of the vessels is brought to the surface. Were they just waiting for Vedran and me to touch a piece of history? We were clearly the first divers to find them. What a strange feeling! A regular day of diving had been transformed into something special. I was aware that we were running out of air and that most of our dive was already behind us, but we still had time to do some quick exploring. The pile of amphoras rose out of the sand to a height of 3-4m. Any wreck timbers had long since disappeared, but the vessels were clearly arranged in the shape of a ship, around 25m long and 6m wide. They were stuck together in a single mass with coral and sediment, and formed labyrinths that proved to be hiding places for red scorpionfish, conger eels and lobsters. MOST OF THE AMPHORAS were sealed. Was there anything inside them? We didn’t see any freestanding ones as we skimmed their tops, loving every second of the experience. 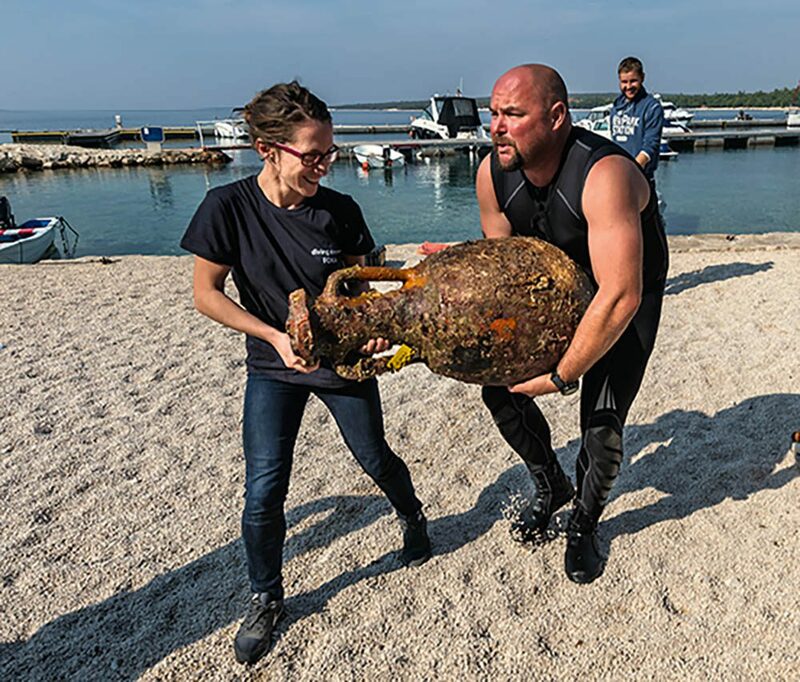 Archaeologist Katarina Batur helps Vedran to carry the freshly excavated amphora to the archaeologists’ base at the dive-centre. Vedran was a few metres away from me when he spotted a ceramic plate decorated with original artwork. It then dawned on me why the Roman anchor was sitting all alone, 30-40m away. The story was beginning to unfold. How is it even possible for such an archaeological site so close to the coast to remain undamaged and undiscovered? And what had happened to the ship? It must have been sailing into or out of the port, as the locations of the anchor and the amphoras lined up with the direction of the bora wind, known to be especially strong in Pag. It would have been easy to lose any sense of time and to forget about the world above, but our dive had to an end. We weren’t very deep and time wasn’t an issue, so the decompression stop on our ascent took only a few minutes. While decompressing, we met the other two divers, who had no idea what Vedran and I had just experienced. I can remember having so many conversations about diving and imagining finding treasure, our very own archaeological site. And now we had found it. Not only that, but it was practically on the front step of the dive-centre! 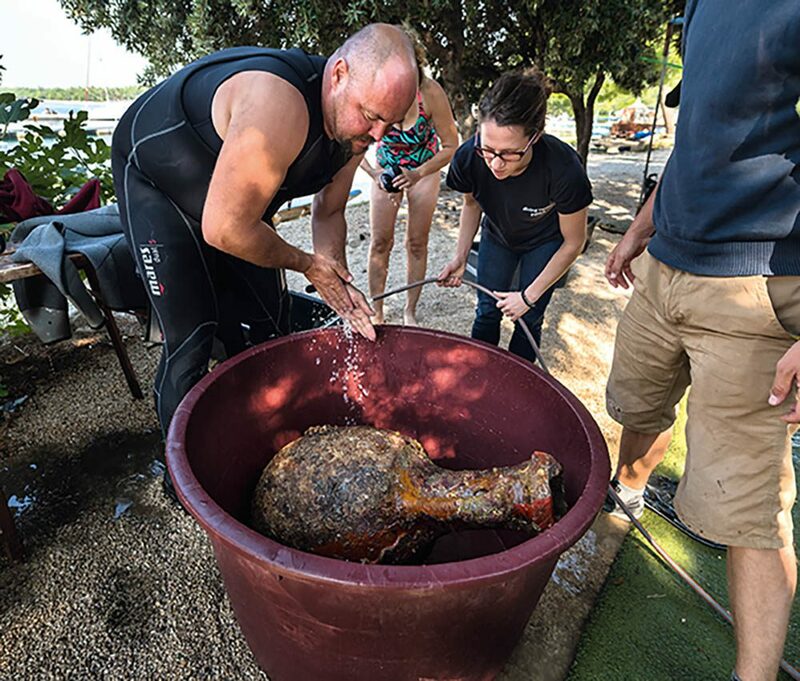 The amphora is dipped into fresh water at the start of the long desalination process. “The sea has rewarded me,” declared the ever-rational Vedran. I’m inclined to agree with him, because I know few people who respect and protect the sea the way that he does. We headed back to the dive-centre. Our discovery wasn’t something to yell about in a crowded campsite at the height of the tourist season, so after things had calmed down and our equipment had been put away, we shared our news with a select few of the centre’s dive-crew, who were amazed. 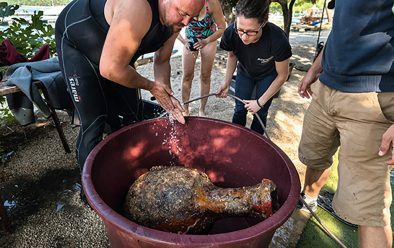 A big part of Vedran’s extensive diving experience is tied to his participation in archaeological exploration projects. 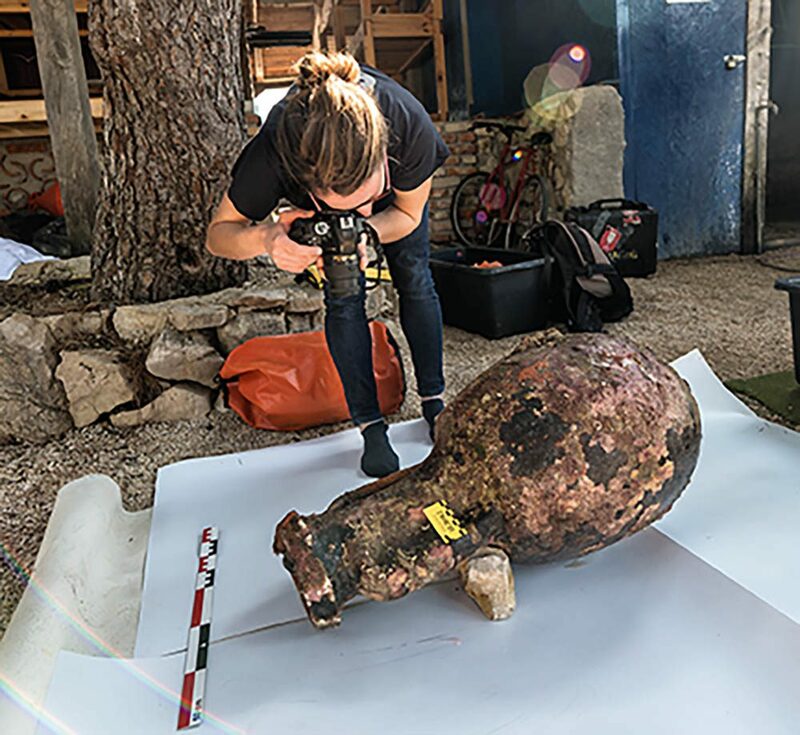 He was soon able to determine that what we had found were Lamboglia 2 amphoras, a type commonly used to ship olive oil and wine in the Adriatic, and dating back to 200-100BC. In the afternoon a small dive-team set out for the site. We took a measuring device and a camera to capture the first videos of the find, and to take the exact measurements needed to file a report. IT WAS CLEAR to everyone that protecting the site would be a key issue, and we felt that it should remain exactly as we had found it. 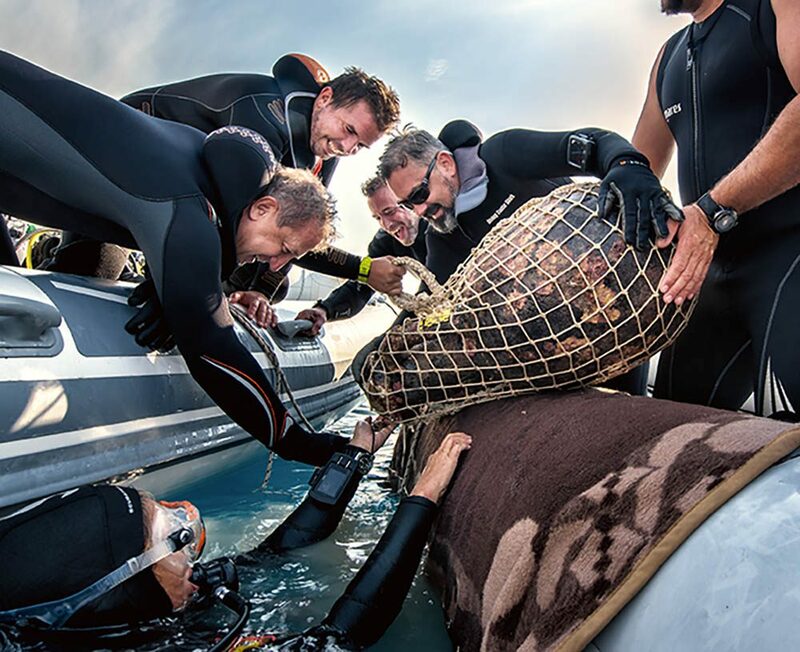 If those amphoras had survived for more than 2000 years under water, they should be there for centuries to come, rewarding others with the excitement and joy they had given Vedran and me. 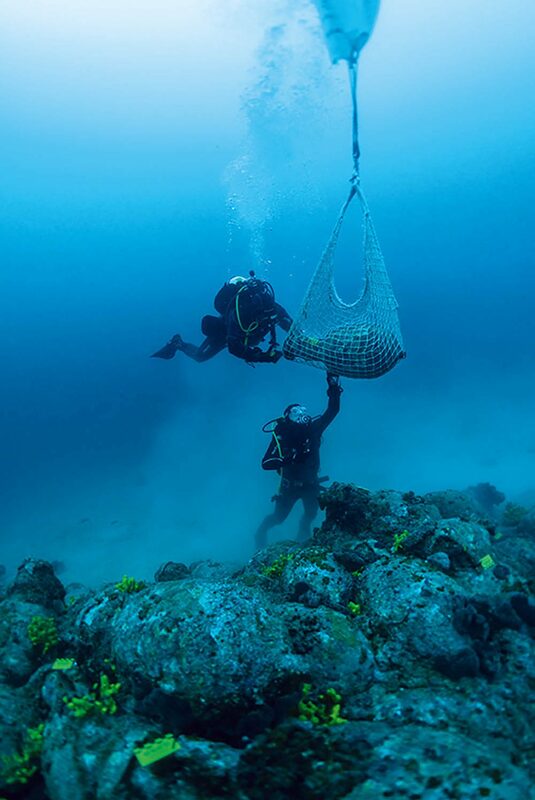 From these ideas emerged a new strategy (the first of its kind in Croatia) to secure the site, one that would be based not on steel mesh but a system of underwater and surface sensors. Recording the first find from the shipwreck. That same afternoon I called Arne, my friend and underwater photographer, and arranged for him to come to Pag as soon as possible to document our discovery. His first pictures later helped to reveal another fascinating detail. A word could be seen engraved on the anchor: Straton. Perhaps it was the name of the ship or the ship’s owner. Arne also accompanied the first archaeological exploration team to the site, where they took their own precise measurements, marked the findings and sounded the depth. They also raised from the site the only free-standing amphora. As 27 July wound down, we exchanged our thoughts, feelings and ideas. We dreamt up stories, fuelled by glasses of wine, about unlucky mariners trapped and drowned by the Pag bora. The sky was clear, and when darkness fell we witnessed a total lunar eclipse, an exceptionally rare occurrence. In ancient times, an eclipse would have been considered something miraculous. But I knew that my miracle had already taken place.